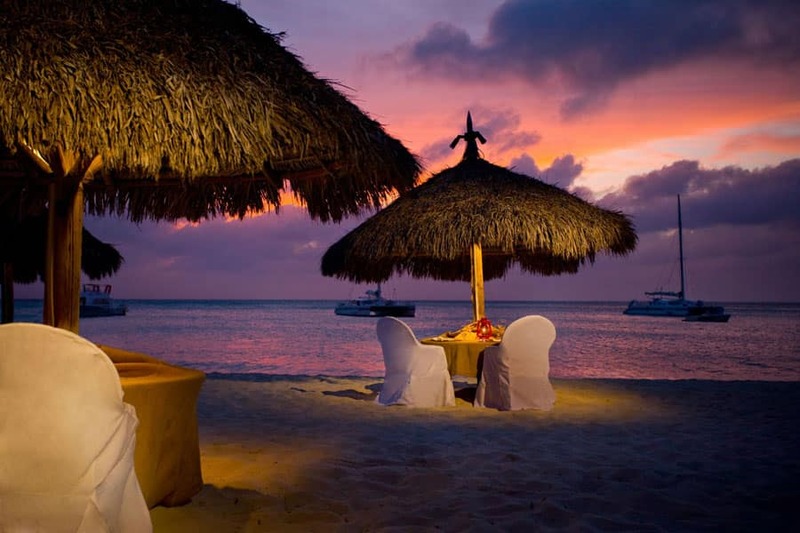 A magical honeymoon in the Caribbean! We had chosen to spend ten days of complete relaxation and fun after having visited the splendid New York City! 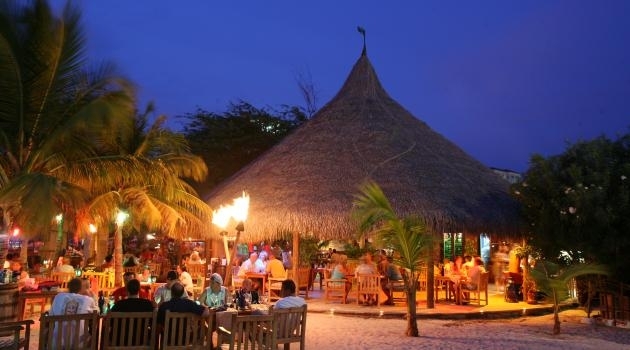 In fact, Aruba is considered the ideal place to go at any time of the year as a “sea extension”, after having visited the United States. Known as a “Happy Island “, it is said that the most social and kindest people in the Caribbean inhabit this small island! The cheerfulness you feel as soon as you are there is indescribable, from our driver, to the hotel concierge, everyone welcomed us with a smile on their face and you immediately felt as if you were in paradise!! As soon as we landed there was a shuttle waiting for us outside of the airport, in fact the natives with big smiles and fantastic hospitality welcomed us! 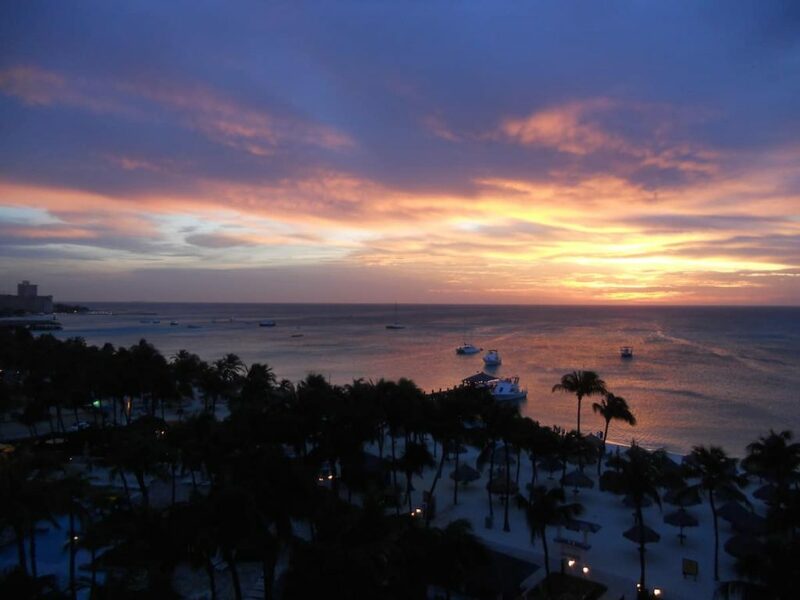 For our “Honeymoon“, we chose the fantastic“Hyatt Regency Aruba Resort and Spa“ located at Palm Beach close to the very colorful shopping center Paseo Herencia. With a “sea view” room we had a view over the thousands of colors on the Caribbean Sea, we awoke at dawn with an unbelievable sunrise and in the evening we were amazed by the spectacular sunset! 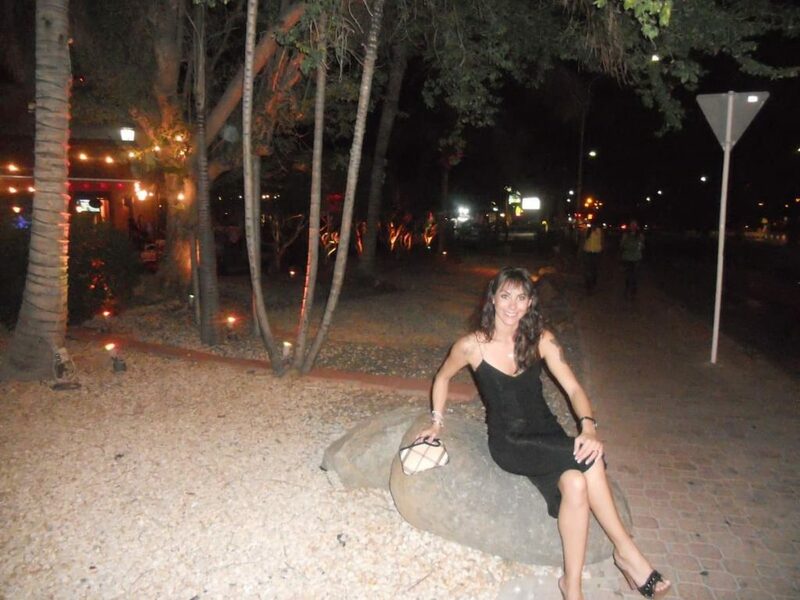 Our first evening in Aruba was spent in a delightful Mexican restaurant, “ Iguana Cantina “, a restaurant full of little fairy lights, directly facing the main square of the enchanting shopping center Paseo Herencia a stone’s throw from our hotel. 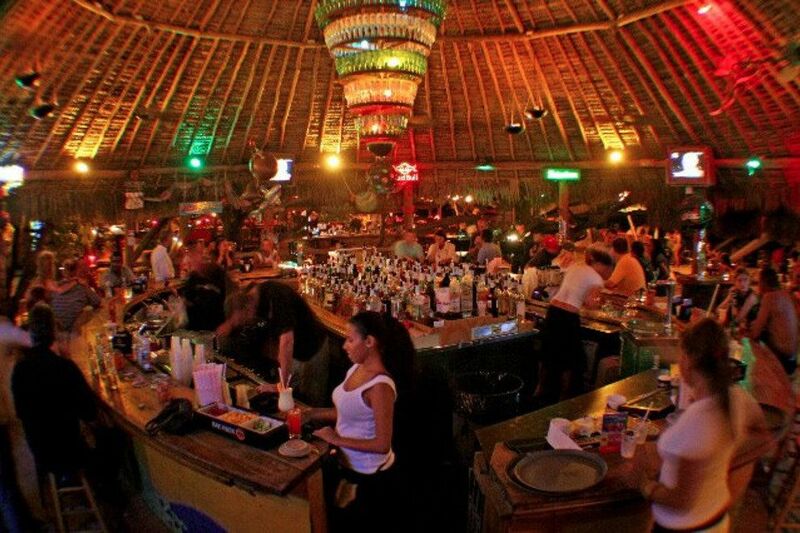 A real Mexican taste in a totally Caribbean atmosphere, the smells and the colors, the excellent food and wonderful waiters welcomed us! When we travel, our eyes open at the crack of dawn. 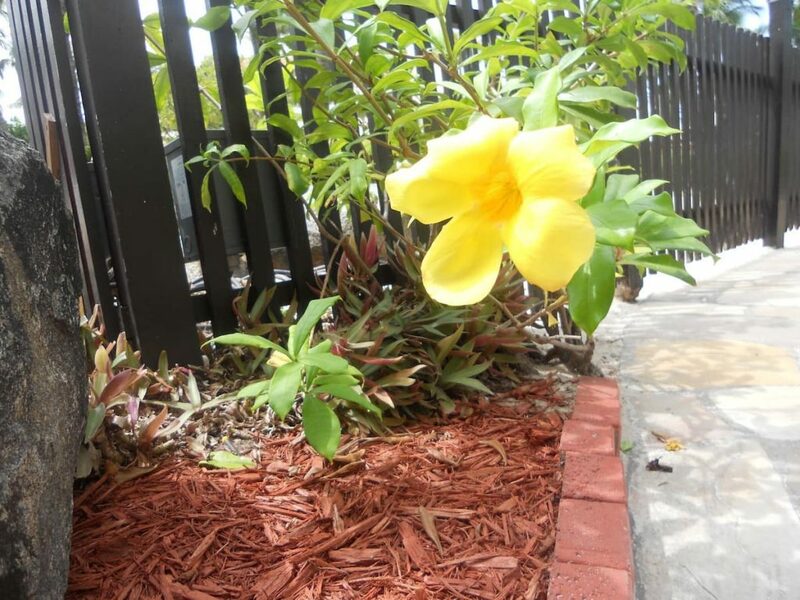 We are anxious to go out and see as much as possible of the place that will give us hospitality for only a few precious days, every minute must be fully enjoyed with the wonders awaiting us. The Flamingo Beach famous all over the world was right there, close to us and so it was easy to decide what we would have done on our first day in Aruba. We had already studied how to get there from home! After a hearty breakfast we decided to take a taxi and drive towards the private beach of Renaissance, from there we took a small motorboat, which brought us on this small island right in front of Aruba in only 10 minutes. It is a small artificial atoll created by a local resort that is open every day from 7 am to 7 pm and costs $99 to enter! 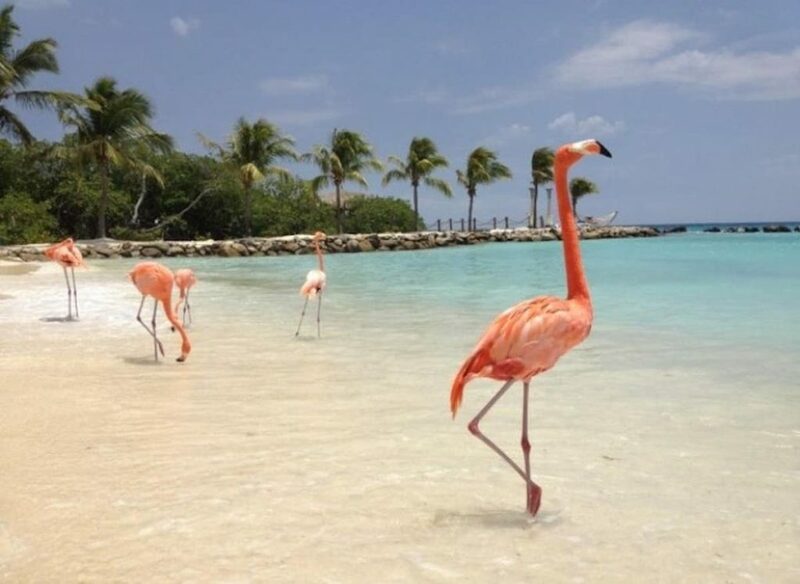 It is an “Only Adults” beach, purposely banned from children in order to protect the flamingos that live there! I wanted to see them and felt excited by the idea of spending an entire day with them… and that is exactly what I did. In Aruba, as in every other tropical paradise, you must take a trip on a catamaran with a slide and a trapeze to dive into the water. 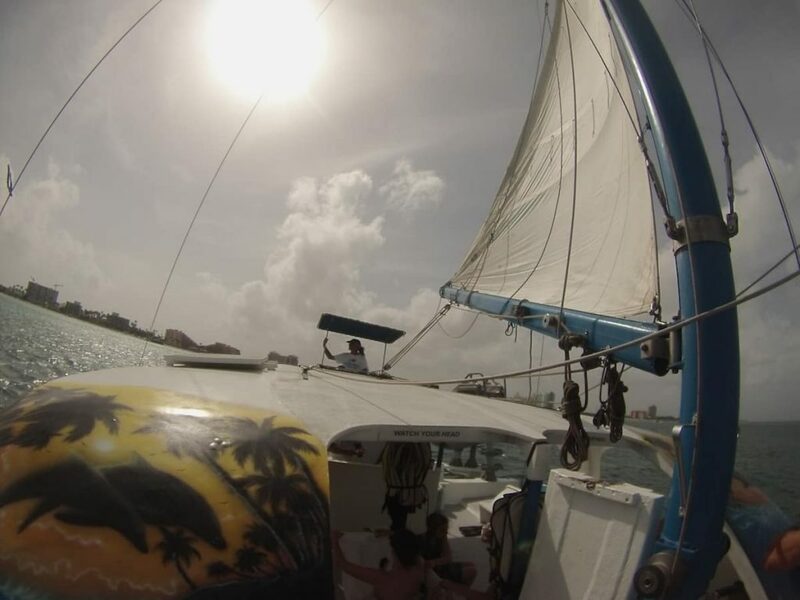 So, after a day spent on the beach at our resort, on a sunbed sipping a cocktail, taking a swim and having a massage to regenerate our body and mind, we decided to go out on a catamaran with the best in this field at Aruba, “Delphi Watersports“ di Grace & Robert! We had no idea what would have been awaiting us, this is the best thing about travelling, not having expectations so that you are then enchanted and surprised by everything you are experiencing. Pleasantly funny people welcomed us on their multi-colored catamaran. Once we sailed off, cocktails and music surrounded a festive and cheerful atmosphere and during the trip we seemed to all know each other, in spite of our different languages, we joked around and had fun! We finally arrived on a wreck that was lying a few meters deep on the bottom of the sea. We put on our flippers and goggles and we dove into this crystal clear water. As soon as we dived in, fish of every color surrounded us, it was a natural aquarium with a thousand hues… yellow, blue, violet and green stood out in this transparent and warm sea. We went back up and took off to reach the open sea… and this is where the real fun began! 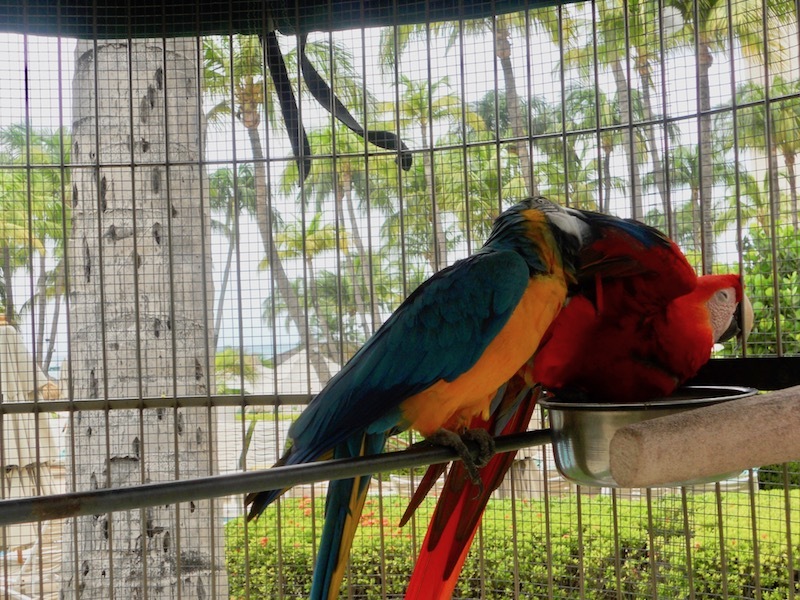 I was naturally the first one to try the water slide and Lorenzo quickly followed me… we had so much fun between the slide and the trapeze for diving in the water, it seemed like an amusement park on the Caribbean! Between local snacks and alcoholic drinks, our trip ended and we returned to shore after four hours of wonderful fun, totally satisfied and happy! Pampered by the sea waves and with our feet in the sand, we had a candle light dinner, but unfortunately the fish dinner had very little taste. The venue was beautiful in an unbelievable atmosphere, but the food was not good. So, we ended up not tasting the dinner and fortunately not paying for it either. So, we decided to go out and get an ice cream at Oranjestad, a very colorful colonial style capital! When we got off the taxi, we were immediately met by small and colorful buildings that invited us to enter into these little streets in the center, a blend of ancient and modern create one of most unique Caribbean historic centers in the world! 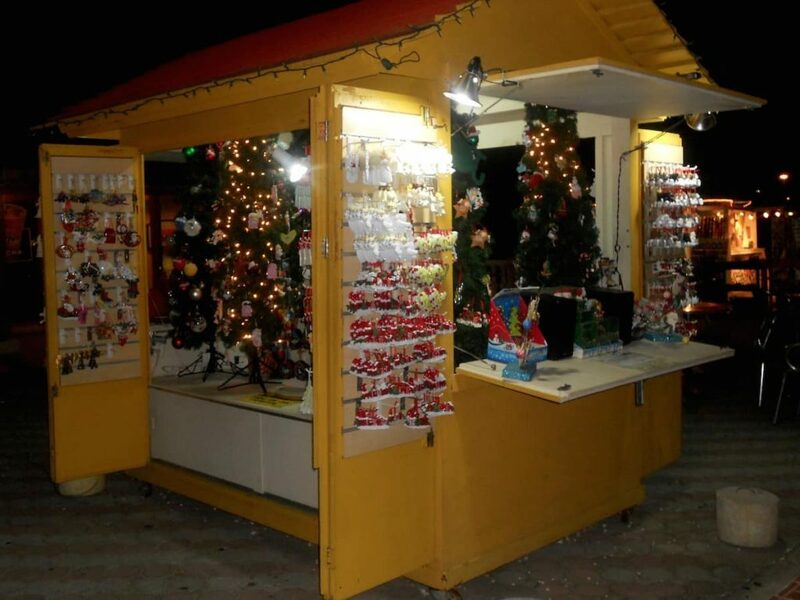 Luxury shops and places full of fairy lights welcome you to enjoy the evening by tasting the food and shopping! On the street you can watch bold Latin dances that are full of energy, little wooden stands that sell local souvenirs and Christmas ornaments, so we decided to buy a few as a memory of our honeymoon! 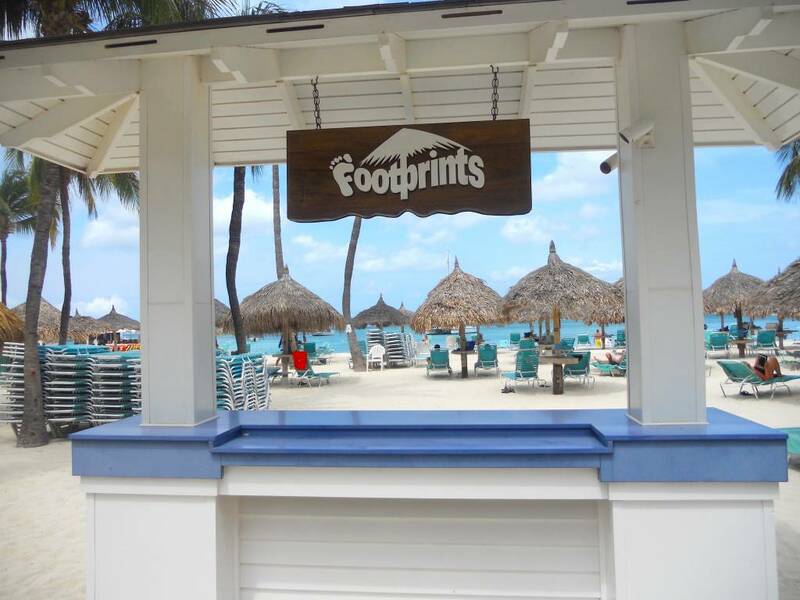 When you are in such a paradise, the days seem to simply fly… you awake in a big, soft bed full of pillows… you go and have a super abundant breakfast with tropical fruit, every type of fruit juice, omelettes and other goodies. you relax and take nice long swims in crystal clear water. All of this makes a trip to the Caribbean perfect in every way. Even our lunches on the beach were pretty good. Walking on Palm Beach you can find “ Carlito’s Sports Beach Bar “, perfect for a good club sandwich, colored salads, tasty sandwiches and excellent cocktails that will accompany you until the sunset, with Caribbean music that makes you only think about the sound of the sea, the heat from the sun and the moment you are experiencing with such a feeling of well being that can only be felt when you are on vacation. Going from Palm Beach towards “ Bubali Bird Sanctuary “, you will find the spectacular “ Eagle Beach “ with its plants called “ Divi Divi “, which seem like gigantic bonsai, with a crooked trunk and a very green and perfect leaves, directly facing the sea on a soft and fresh beach. While you are sunbathing you could incidentally meet the “Aloe Man”, a character who is dressed in very loud green and yellow colors, who strolls while selling pure aloe juices and creams, an attraction on the island of Aruba that I could not miss, as I bought three bottles of cream that I already finished some time ago! 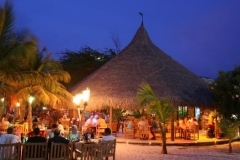 We decided to spend the last night on our “Happy Island”, at “Faro Blanco Restaurant“ on the far northwestern part of the island. The thing that distinguishes this place is the Lighthouse called “ California Light house ”! As soon as we arrived we were welcomed in this unique, although in my opinion, a bit gloomy place… with a breathtaking view, a postcard sunset, with brilliant red and orange colors! After having taken various pictures of the sunset and the lighthouse, we went to dinner with an Italian-American couple that we had arrived at the hotel with by taxi, Maurizio and Anna! 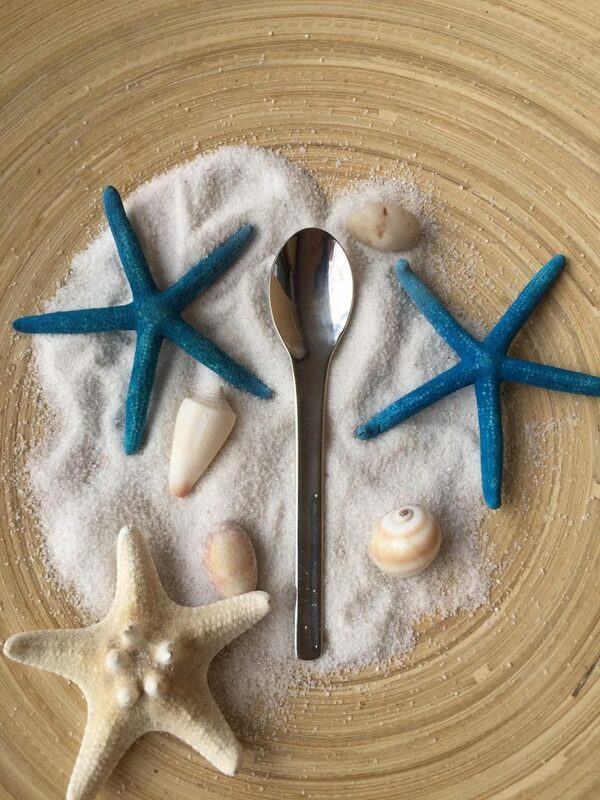 My spoon of the caribbean!! The “Italian” fish dinner was tasty and pleasant, as the evening passed chatting and drinking wine with our new friends, I realized just how little the world really is and how our everyday problems are the same wherever you live! A good cup of coffee finally arrived and right next to the cup I saw a delightful spoon lying on the saucer and immediately attracting my attention. As I slightly hesitated, I finally manage to “GET MY SPOON”, which incidentally found its way in my evening bag! 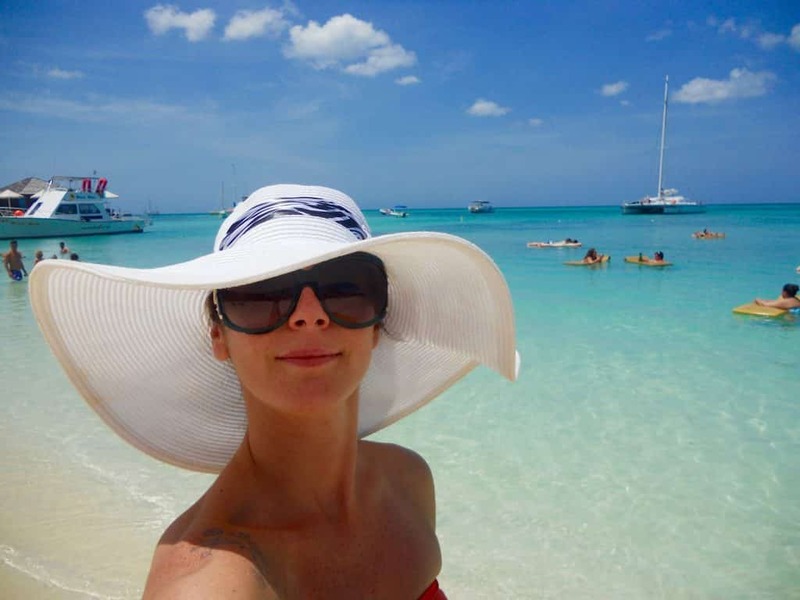 Our days in Aruba allowed us to discover magical sea beds, a lighthouse dominating the island, Airkok Park, considered a national treasure to be protected, a unique beach full of pink flamingos and evenings dancing and drinking amazing cocktails!! Do I think you should go? It’s useless to say that I would go back tomorrow… but the world is too big to go back to the same place twice, so what are you waiting for? 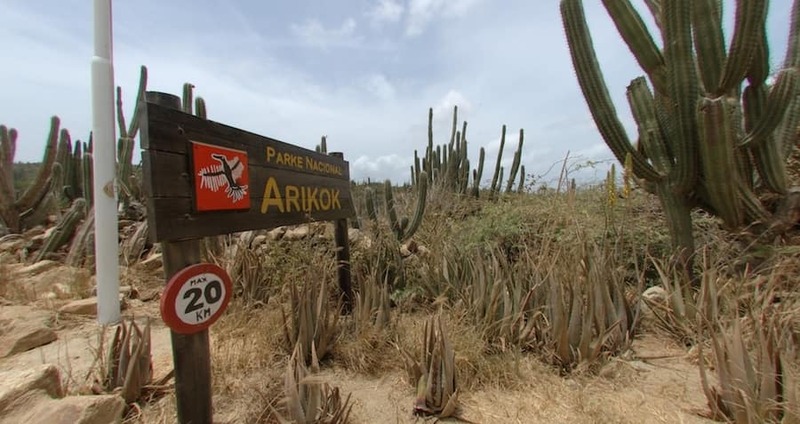 Dive into one of the most spectacular seas in the world… Aruba…. The happy island that will cuddle you and give you unforgettable memories! You must wake up at 6 am to go to the beach and reserve a beach umbrella by putting your towels on the beach lounges. It is also a good excuse to get up early and see the sea deserted and calm, as only the dawn can show you. 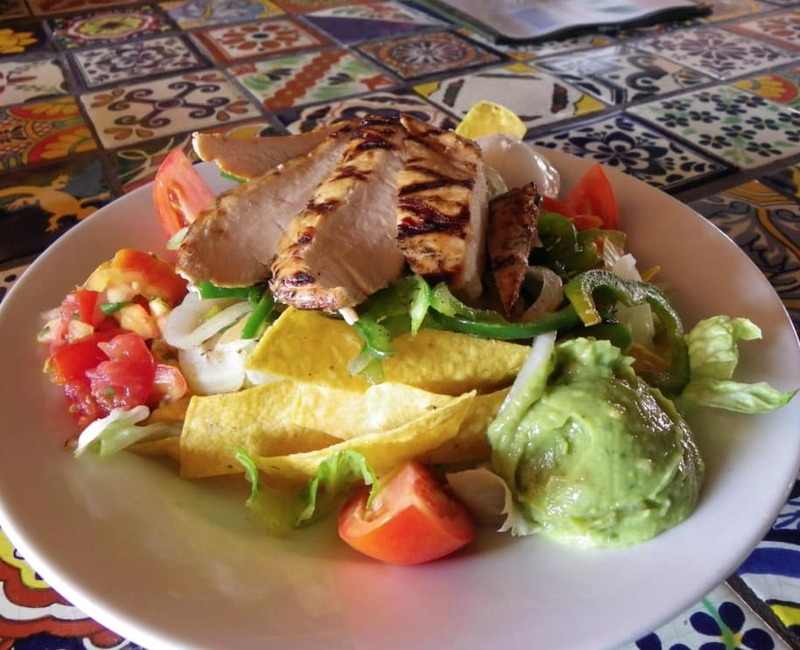 Breakfast was served at Ruinas del Mar,a hearty sweet and salty breakfast, with the espresso coffee as the only thing that was not good…. Absolutely undrinkable! Transportation and services were excellent! As usual, we had already studied which excursions to go on from home and the only excursion we reserved from Italy was the one to “ Flamingo Beach”. For all the other excursions, the receptionist at our hotel was available for making reservations! High protection factor sun block, a hat, and comfortable shoes for the excursion to Airkok Park and good taste in how you dress!!! Arrivo nel pomeriggio e relax..
“Delphi Watersports“ di Grace & Robert! 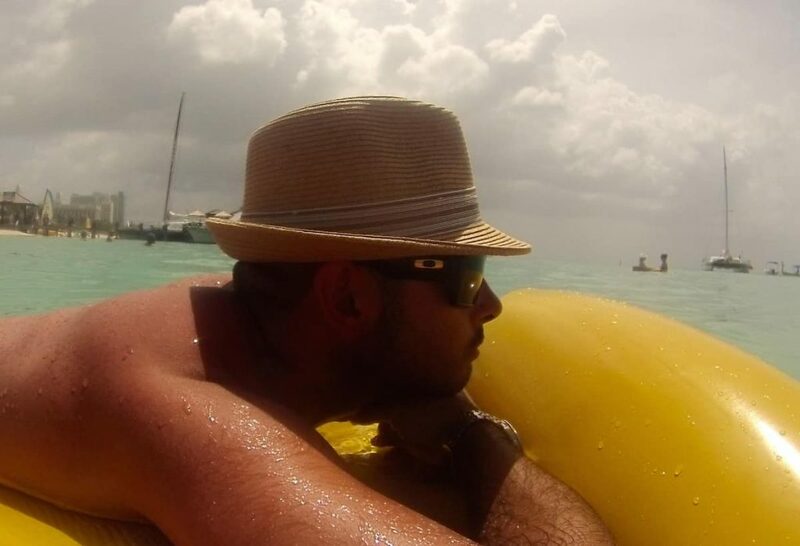 "Aruba è un isola che ti lascia un dolore dolce alle mascelle… sono i sorrisi perenni che fanno questo effetto!! E’ un puzzle colorato, che mentre lo vivi si realizza di fronte ai tuoi occhi mettendo in evidenzia uno scenario unico, che solo un isola caraibica può regalarti!! Questa è la mia Aruba ! L’isola della felicità!!!" all att the moment but I have book-marked it and alao added in your RSS feeds, so when I have time I will be back to read much more, Pleease do keep upp the awesome work.